Thread: What the hell yellow! As many of you know I like things that are French or remind me of Paris. I love yellows and blues together. I decided to hire a painter to paint my walls yellow. 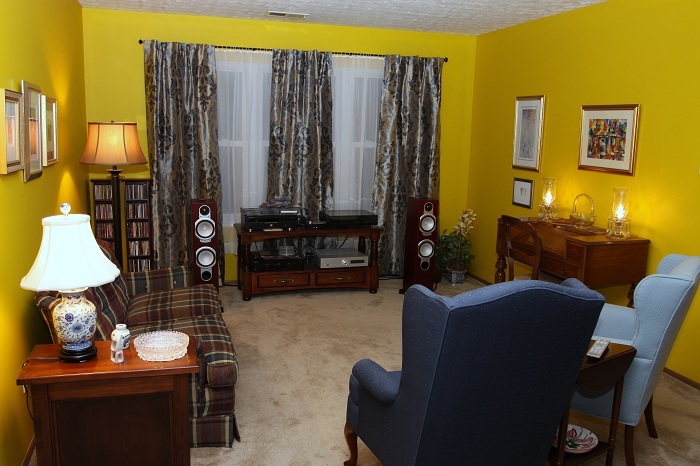 We looked at sample colors and between his times in Provence and my visiting Paris we thought we had the perfect yellow. This is what I came home to expecting the place to look like the paint sample we had chosen. Thanks but I wanted it to look French not French's Mustard. Yikes! The yellow is great per se. 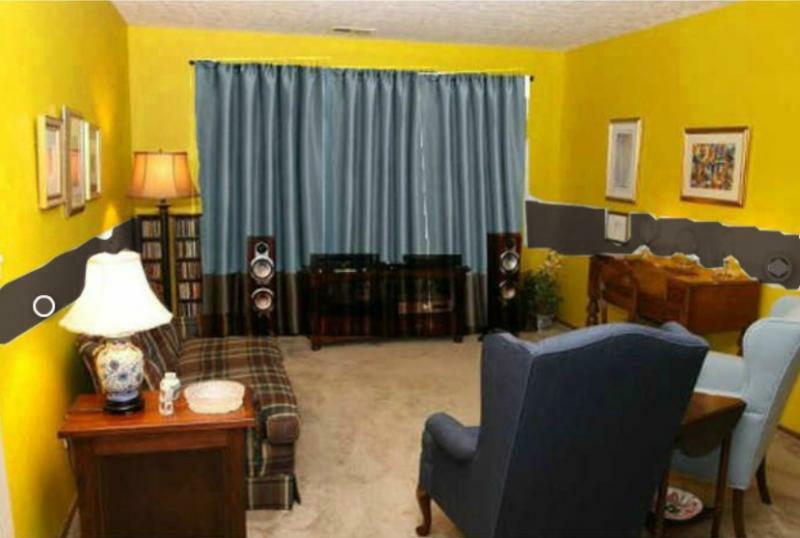 But really it really doesn't go with your couch or drapes. Because it is not the right yellow! 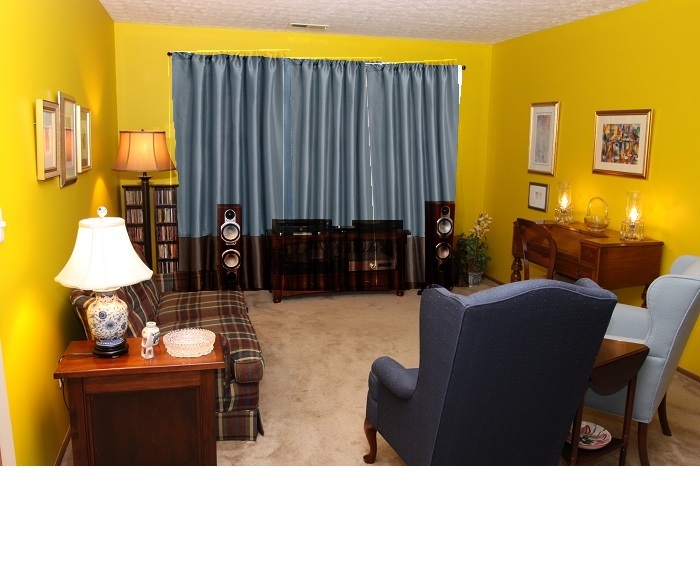 The curtains have two shades of blue and the couch has blue and my two chairs are blue. The right yellow would have been pretty. What does Corky think of it? Yes, perhaps. It would need to be a paler, somewhat less saturated yellow. Have to say it: I hate the drapes in any, or maybe it's just the picture. 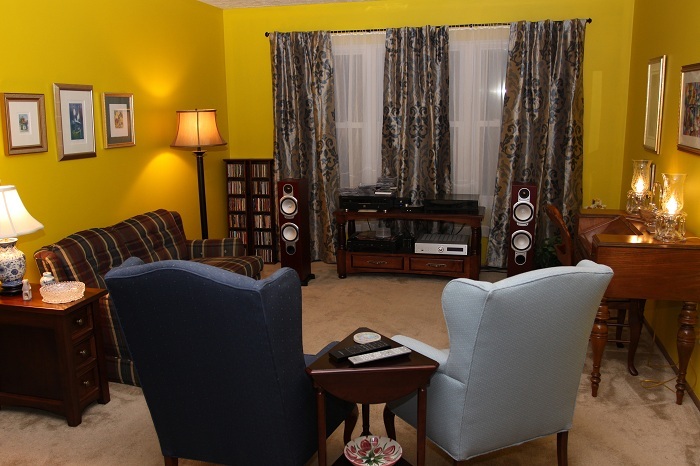 What is your advice great interior decorator? I should mention the curtains look like they have a sheen but that is the effect of the flash. Now, now, I make no claim to greatness. But the intricate, scroll work design of the drape fabric clashes with the rustic fabric of the couch ... no? Only until I buy the new settee. This is a work in progress. If I were wealthy sure I could do a room all at once but such is not my lot. I do not think he liked being in his bedroom while someone was in the apartment. When I came home and let him out, while the painter was still there, he was very affectionate and stayed close. I wonder if he thought I was home and ignoring him. I do think the paint smell affected his appetite I know the color affected me. 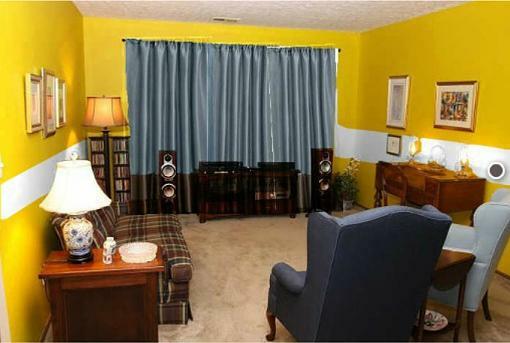 If you're going to keep that color, I'd suggest crown molding. Even if you change colors later, the crown molding adds elegance and sophistication, but crown molding really, really is almost required for bold wall color (IMO, of course). I agree with crown molding but that is more I want to get into for a rented apartment. The problem is this...color is light. You can go to a paint store and look at colors all day long under fluorescent lights and it won't tell you squat about what it's going to look like on your walls, in your lighting. 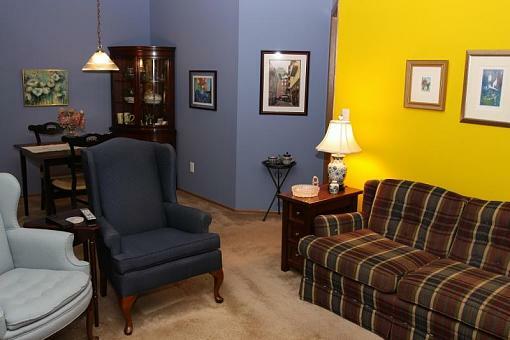 When you hire an interior decorator, do they say: "come on over to my office and we'll pick colors"? Nope! They have to come to your house and see those colors on your wall, in your light. That's why most major paint retailers are now offering 1/2 pint samples for you to try out. You can get a few square feet on the wall, which will really help you home in on that Perfect Color. Don't forget to look at it in the morning, the afternoon and the evening...as the light changes, your perception of the color will change. Better to make a $3.00 mistake than a $25 to $35 one. P.S. Yellows are the trickiest colors to get "right" They have a way of "taking off" on you, usually in the wrong direction. Try going to a lighter, more muted version than what you think you want. Last edited by RoyY51; 09-29-2012 at 06:53 PM. P.S. Yellow are the trickiest colors to get "right" They have a way of "taking off" on you, usually in the wrong direction. Try going to a lighter, more muted version than what you think you want. Very good advice and where the hell were you when I needed you. Yes yellow really got away from me. I wish the painter I hired had as much knowledge. I should have chosen the paint independently of him and just had him apply it. Lesson learned and thanks for the information. Well I think I need more light so I am going to switch to the shear curtains. I will also bring out the rug I have used in the past. It has more blues and some yellow. I saw a settee that was beautiful and the right shade of blue but the wrong price at $4,600. Here is a new idea I had. I combined my new curtains that I like with my shears for more light. I agree crown molding is a must. I like the yellow - furniture and drapes need to somehow match up. Softer colours probably go better with bold wall colours. There might be simpler alternatives to crown molding. I have seen plan white, embossed wall paper strips, ~6" wide, that would have a similar effect. I have installed crown molding, and although it doesn't require a lot of technical skill, it is a pain. Transporting, precision cutting, and installing long strips high on the wall is tedious. 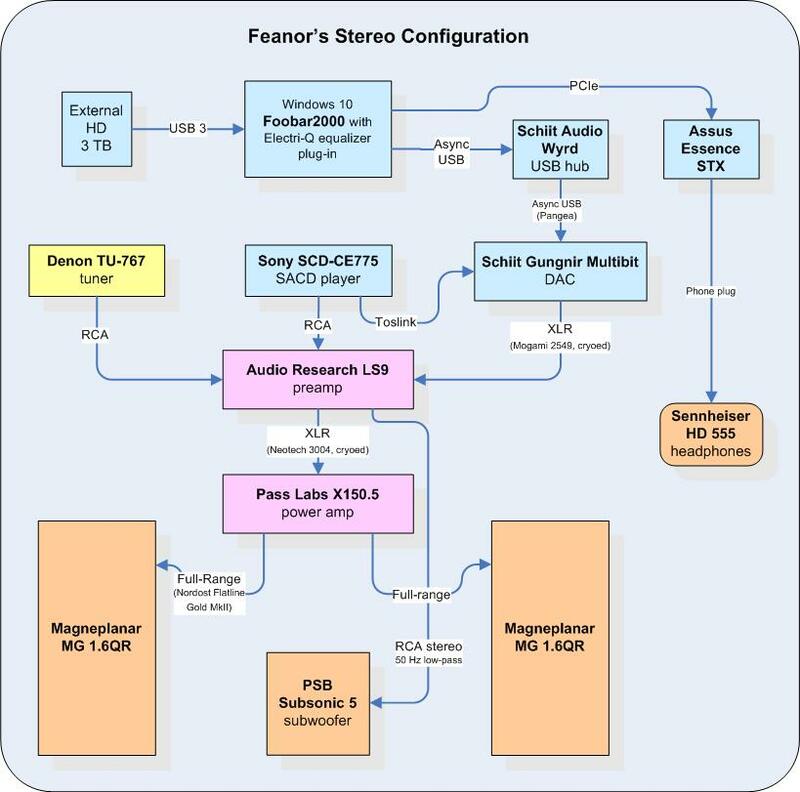 Last edited by Feanor; 10-01-2012 at 04:01 AM. Monday the dining area walls are going to become steel blue. The painter is coming at 8:00 AM to transform my walls. This blue is similar to the light blue in my curtains. I will post a picture or a red X for some. I have been watching too much HGTV and David Bromstad told me not to be afraid of color. So David hold me and I will not be afraid of color anymore. I love yellow and blue. Seriously, it is rather intense, but beauty is in the eyes of the beholder. How about a new curtain??? Or how about some strips? ?